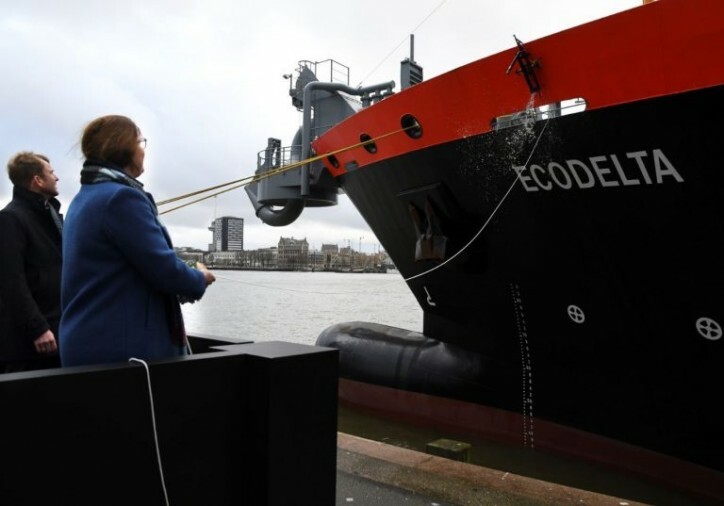 Van der Kamp’s new trailing suction hopper dredger (TSHD) Ecodelta was christened last Friday (January 11) in Rotterdam. According to the Port of Rotterdam, this is one of the few LNG powered trailing suction hopper dredgers in the Netherlands. The ship is a key component of the new contract entered into by Bagger & Aannemingsmaatschappij Van der Kamp and the Port of Rotterdam Authority. As reported earlier by the Zwolle-based dredging company, under the agreement signed in November 2017, the newbuild named Ecodelta will be responsible for keeping Rotterdam’s port basins at the correct depth until 2023. All in all, the contracted work concerns an annual volume of 5 million cubic meters of dredged material. Distinguishing it from a conventional dredger, the Ecodelta is equipped with two ‘sweeparms’ to remove oil from the water surface, allowing it to quickly react to emergency response situations. Volume LNG tank (approx.) 325m³.